The Scarlett Rose Garden: Eeeeek! Dead mouse! Some of you may remember my complaining about my mouse shortly after I started blogging. It wouldn't scroll any more. 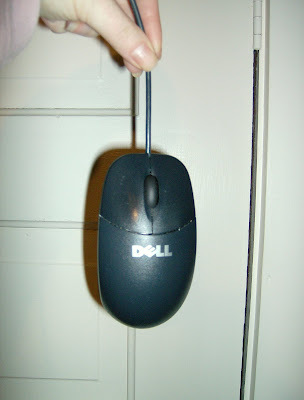 Yes, there are other ways to make your mouse scroll, but the wheelie button thingy was my favorite! Being that my desk is against the wall, and it has a back on it with holes cut out just for cords, I was not looking forward to getting back there and switching mice!! Alas, my mouse was getting worse. It would jump all over the page, wouldn't highlight things where I wanted it too, wouldn't roll across the page. Bad mousy!! So finally, I blindly reached behind my tower left handed and unplugged the old mouse. I am right handed, and trying to put the new cord into the back of the computer without seeing it was extremely frustrating. Took forever! Goodness knows I didn't want to accidentally knock another cord out of whack! happy scrolling days are here again! Get it Melly and Katie, get it!! ROFL! Cats love a dead mouse!!! This was a cute post! How funny! I thought it was a real mouse! So happy it was this kind of mouse. I fear my little guy is also on his last legs. I'm getting the same thing going on as you described. I have a cordless one so it's easier to work with...no reaching behind to unplug. Ohhhhhh, I see the problem...it's a Dell. We have those at work and I swear they are like a Daisy razor...meant for a short life & disposable! Good riddance to it! I had so much trouble with my bad mousie, that my mother~in~law surprised me with a cordless one for Christmas. I can't tell you how much I love it!!! Those cats are gorgeous by the way! What a cute post...with the kitties investigating the dead mouse! LOL! 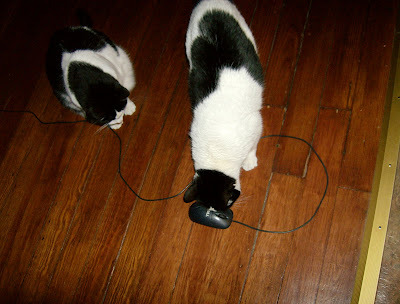 Hope you are having a great day with your new mouse. I know the feeling of trying to change out a dead mouse...or I should say... DH knows. He had to change out ours recently...and we have a roll-top desk too. It's a pain to do anything to the computer! I'm glad you got a new mouse...it will make being on the computer alot more fun! I got a good laugh from this post, leave it to you to come up with a creative way like this!